When Nambe contacted me to see if I’d be interested in hosting a giveaway, I immediately replied to that email YES! Everything they sell is absolutely stunning. Nambe’s pieces are of the best quality and the beauty outshines any food you make. That says a lot coming from this baker girl! Their products would be a perfect gift for a bride and groom, an anniversary, or just a big splurge! I’ve already picked out some other items I LOVE. This tray is made of acacia wood and has sturdy alloy handles. I’m in LOVE with this tray. The tray retails for $225 (and one of you will get it FREE). I know you all will be pleasantly surprised how gorgeous it is as well. Also, be sure to scroll down and check out the recipe for this beautiful Apple Kringle. Just in time for fall entertaining! For the crust, mix ingredients together until fully combined. Dough will be sticky. On a large parchment paper lined baking sheet, shape dough into a 13inch by 4inch rectangle. (will be thin, try to make even thickness). In a small saucepan, heat water with butter until it boils. Remove from heat and bean in flour. Add eggs, cinnamon, nutmeg and sugar. Mixture will be paste-ish, it's perfect. Lay sliced apples over first layer (crust). Then pour (drop) layer of "filling" over the apples. Bake in a 350 degree oven for about 50 minutes. Remove and let sit for 10-15 minutes. Slide parchment paper onto cooling rack and continue to cool completely. For the frosting, beat butter with vanilla, cinnamon, milk and powdered sugar until desired consistency. Frost kringle while slightly warm (NOT HOT). Let set about 20 minutes. ENJOY. Beautiful Tray!!! Thanks for the giveaway. Thanks so much for this giveaway, I would use my tray to display my healthy treats on when I have company over! Healthy treats? What are those??? Great idea! This would be perfect for cheese and crackers! Thanks for the kind words! I would use it for cupcakes, my favorite! Although that apple kringle looks great, too! I would use it for cupcakes or cookies. I love making them! That wood is absolutely amazing! Would love the tray for the holidays 🙂 plus apple anything is delicious! Yum!! What a beautiful tray! I would use it for coffee & brunches! Thanks for the opportunity! I would put it on display. Maybe, I would use it for only very special holidays, like my birthday! Just in time for all the upcoming holidays, I could use this tray for all sorts of desserts from Thanksgiving to Christmas and everything in between! I would use this tray to bring special treats to the groups of young women that I mentor. It is stunning! I would use this tray to showcase my cookies for our big holiday cookie exchange! I love beautiful platters and trays!! Gorgeous tray! I would keep it sitting out on my corner cabinet in my living room because it’s too beautiful to put away! I’d most likely use it to serve drinks and/or snacks to my friends. To serve some sort of yummy at our weekly lifegroup night! Mmm, your apple kringle looks superb. that kringle looks so good! I’d take soooo many food photos on that baby – it’s perfect and stunning! Apple Kringle sounds wonderful, and tray would be nice too! i would love this tray to set appetizers/snacks on during football season! I would use the tray for family night snacks! I would put a flower vase and some sugary sweets. That is a gorgeous tray!!!! Nambe has some of the most amazing pieces! I see loads of Christmas cookies out for a party on this!!! This tray is gorgeous! I would use it for cookies, of course. well i came here to check out the delicious apple kringle recipe as i have a crisper full of apples and need to use them up, but then i also saw the lovely tray. i think it would be wonderful as a cheese and fruit tray : ) thanks for the recipe and giveaway! The tray is gorgeous! I would use it to serve all the yummy recipes I steal from your blog! Oh, and it would be awesome to use at my Tastefully Simple parties! Awww. It would be perfect for your Tastefully Simple goodies! Beautiful tray! I would use it to serve birthday treats this month. We have 2 birthdays coming up! The tray is gorgeous. I can see it with pumpkin muffins sitting on top! I could use the tray to serve snacks at parties, or goodies at out holiday parties. It is so beautiful! Would love a tray like this for serving all kinds of goodies!! And lovin’ the recipe! I would use this for my upcoming holiday party! I would use it serve breads and muffins. This is a beautiful tray!! And the plates are nice too! I would use it for EVERYTHING! It is way cute! I’m going to use it in photos because it is that stunning! Oh, and make this kringle too. SO GOOD. The tray would be lovely for serving an assortment of mini muffins. Thank you! Ahhhh, I love this tray. Would be a great gift I’d use all the time! My teens have friends over all the time and this would help me manage all the snacks between the kitchen and the basement TV room! 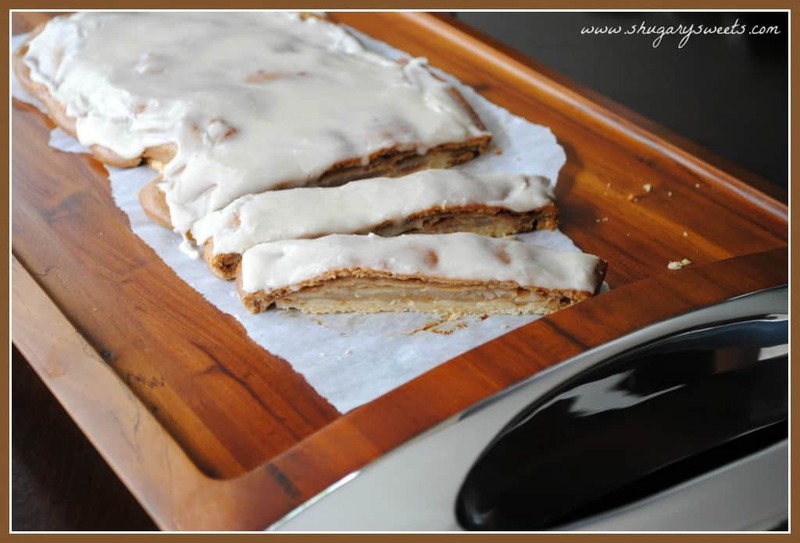 Love this kringle recipe sooooo much also!! I would love this tray! Oh my gosh your apple kringle looks amazing!!! The tray is also very beautiful!! I would love this tray!! I love it. I have no serving trays really so this would be wonderful since I host Thanksgiving and Christmas!! wow this is a BEAUTIFUL tray! how would i use it???? ?think i would put it on my table and droll over it,and pinch my self to mach sure that i win it!!! Wonderful giveaway, the tray looks awesome. I would use it to display the desserts I make for when we have company. The tray is just gorgeous! The kringle is fabulously delicious looking!! 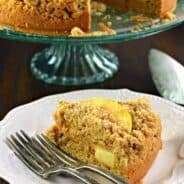 Thank you for the recipe and the giveaway! Definitely making this cake for our school’s Teacher Appreciation luncheon! This is such a pretty tray! I would use this tray for dinner parties that my friends and I have once a month! What a beautiful tray! I’d use it for appetizers for our next get-together. Love,y tray. Would be great for fall entertaining. Wow, super pretty. I’d be using the tray at our annual Christmas open house. Beautiful…thanks for the chance to win. I would love to use this for food photos! I would use this tray at my Cookie Exchange Party to show off my best cookies! All kinds of things! We host a small group at our house weekly. I am always cooking for them. Bread, rolls, cookies, cheese and crackers, sandwiches all come to mind. It also might look awesome using for a centerpiece display on a holiday table! Very beautiful! Every Sunday, I do a Breakfast Is Served post on my blog, so the tray would be perfect for it!! I love baking–and sharing what I have made! This would be great for taking goodies to work or to a lucky pot with family or friends! I would use it to serve muffins. I am in love with nambe!!!! Can’t afford it but dream of getting it all the time! This tray is gorgeous!! Love the tray – so stylish! And the Apple Kringle sounds very delicious! I can see using it for serving at parties but even more so breakfast in bed or coffee in the morning on the back deck. What a treat that would be. I say, it’s so beautiful, enjoy it everyday! I have never seen or heard of this before! Looks so yummy!!! Such a gorgeous piece! I think it would look just lovely topped with an array of fresh baked cookies! I would love to use this for entertaining this fall! I would use the tray for serving appetizers at my next party. What a wonderful giveaway. I love Nambe. In fact I was just in Nambe NM a few days ago! Beautiful tray and gorgeous food from Shugary Sweets! Gorgeous tray! 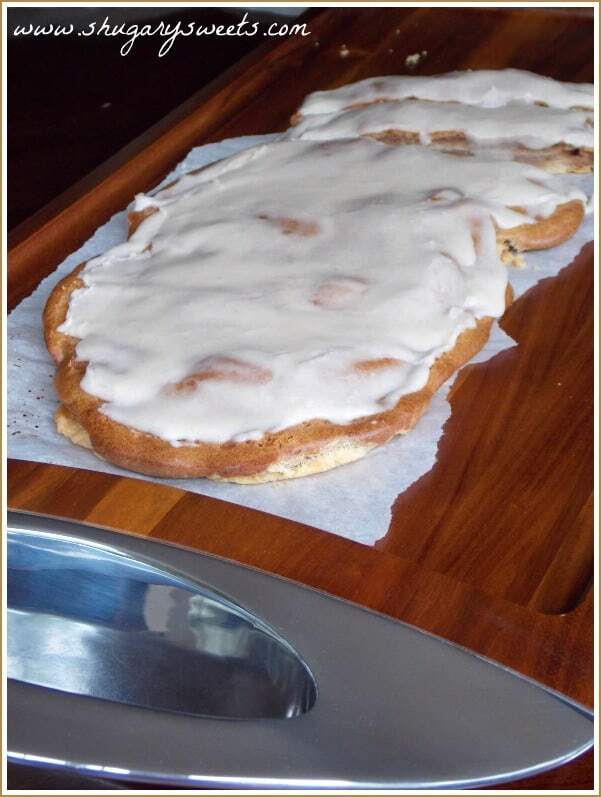 I do believe I will put that delicious looking kringle on the tray first! I would use it for the upcoming holidays to put some appetizers on…I love it…ciao4now64 at yahoo dot com. I would use it to replace my old gluten-infested serving tray. It would be a gift to my mother so she could put her apple bundt cake n it for Christmas. It’s lovely. I don’t have a lot of serving dishes. I could use something pretty to bring in the goodies I make on my days off and bring them in to work. Recipe looks amazing. The tray would be nice for our delicious cheese ball we serve on Christmas Day. I think both are GORGEOUS!!! Beautiful tray and yummy looking treat! I would use the tray to serve dessert to our book club! I would use the tray when my mother’s group gets together and lets our little ones play. We love to bring snacks for the moms, too! And this beautiful tray would be a show-stopper. This looks delicious and the tray is beautiful! Wow! Beautiful tray. Love the richness of the wood. thanks for chance to win it! 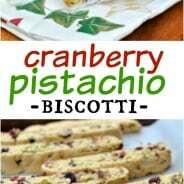 Oh this try will be wonderful for serving dessert with the upcoming Holidays! This would be great for cheese and crackers. So beautiful! Kringle is an all-time favorite of my husband’s. They used to have them brought in from some famous Kringle place (I don’t remember which one) when someone would travel there for work. Now I can make my own! WOOT! I would use it to serve buttermilk biscuits and jam or apple butter! We eat a lot of biscuits in my house. This tray is awesome!!! Walking in with a breakfast in bed service would be quite the sight! I would love to display some football finger foods on this tray! Thanks for the giveaway! I would use the tray to serve some really good cheeses on with all the trimmings – such a beautiful tray! I would love to serve my traditional Christmas Wreath Bread on it. It’s the only time of year I make it. That would be so special! And beautiful cookies the rest of the year! Wow – that’s gorgeous!!!!! I think it would look beautiful simply displaying crackers and cheese! This tray is beautiful! I love it I would definitely use it to show off my desserts! When not in use I would display the tray itself. I also love the plates!!! Thanks for this awesome giveaway! I would use it anytime I have someone visit my new apartment, but have it displayed all the time! I love the clean-clear lines of the tray. I would look for an opportunity to use it no matter the meal/food. Maybe an area to deposit mail between uses rather than storing this art piece. I am forever in love with Nambe! I ♥ Nambe! Thanks for the giveaway. I would use this tray to serve up yummy treats for girls night! I think I would place it on our coffee table until I need it, then serve appetizers from it at our next party. I would use it to hold pie. I like pie. This is beautiful. I’d use it to take cocktails and snacks out to our patio. The tray makes the kringle look like it’s fit for royalty. When beautified by such an elegant serving platter, all food is made special! Nambe products are art, bringing grace and beauty to everyday items. So I would use this tray everyday, for every reason and for no reason–for snacks, fruit, cheese, family, friends, or just for me. 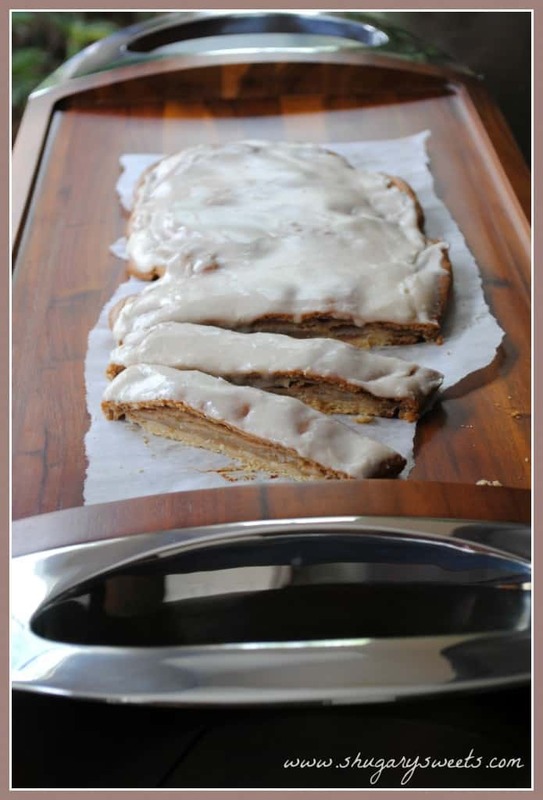 Such a beautiful tray…and the kringle looks delish!!! Can’t wait to try it. It looks awesome! So does the yummy kringle! I have been looking for a tray, and this one is beautiful. The kringle looks very delish. Thanks for the opportunity to enter for it. that beautiful tray is distracting me from that delicious looking kringle! The kringle looks absolutely amazing–I have it bookmarked! Breakfast in bed on a tray, anyone? What a lovely tray to display my cheese and crackers for a wine tasting. Love it! This tray would look great in pictures! And an easy way to transport shacks during football season! Love the blog, and the tray!! The tray is beautiful! I use it to serve at my mom’s bday party coming up next month. Can’t wait to try that apple kringle, btw!! Would love to have this beautiful tray, to display my desserts! What an amazing tray! I just love nambe! I would use it to display all of our desserts! Display bread and desserts. Love it. I’d use the tray to display all the treats and cookies I make for holidays! I would really like to make an apple bread and serve it on this tray! Such a beautiful tray! I would use it for serving all kinds of baked goods. This apple kringle with that glaze looks so enticing! A beautiful serving tray. Love it! I want this tray so bad!!! Please pick me! I would put my Christmas Buche de Noel on it! That tray is gorgeous, and the apple kringle looks super yummy! BEAUTIFUL tray for a beautiful dessert! Beautiful tray! It would make my cookies, cakes, etc. look even better! I got here too late and someone else got my prize, oh well.. I’ll win next time 😉 I’ve never heard of apple kringle before and I think I’ve been missing out! That looks amazing! I just was looking through your fb and found this. 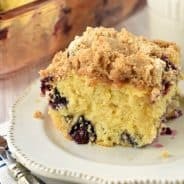 I’d like to make it, but I have a question about the directions. The picture looks like there is a crust on the top, however the directions don’t mention a top crust. Am I looking at the picture and thinking there is a top crust or is there a step missing in the directions? Just wondering. I’ll be making this..looks good either way 🙂 .